So… this year’s “thing” among the boys in Red Ted’s class is SKYLANDERS. I confess, that we do not own a wii or any sort of games portal, but that my son has a lot of the Skylanders figures. I think they are cool and he loves to play with them. He takes his Skylanders to his friends’ houses and plays there. For now it seems to work. And it doesn’t stop him from loving Skylanders! So when his birthday came around, we knew he wanted a Skylander’s themed party. This year, we kept it simple – we had a sleepover (6 kids in total), so only had a handful of party games, some homemade pizza and a movie. 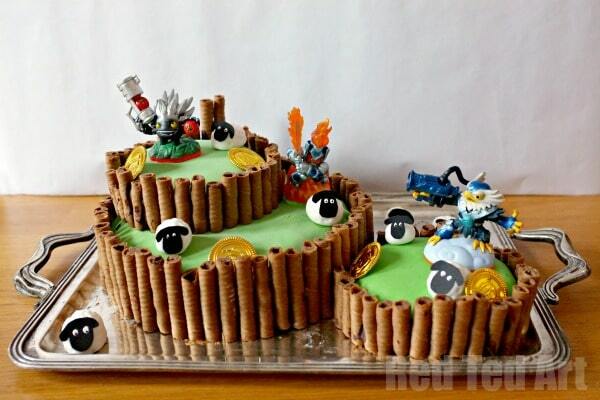 BUT.. of course that also meant a Skylander’s Cake Ta-Daaaaaaaaaaa…. 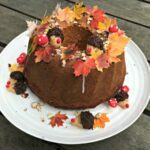 (we got the idea and inspiration from THIS CAKE – thank you thank you thank you!). What do you think? 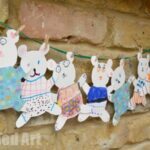 I don’t have a full “step by step” how to or guide, but do have some pictures to share with you, should you need inspiration!! 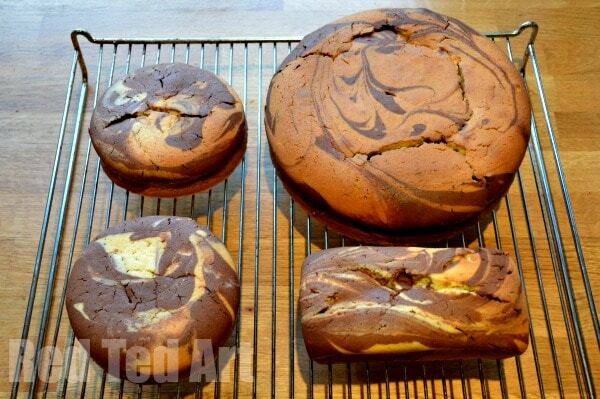 1) Bake your favourite cake recipe as per instructions. Let cool fully. 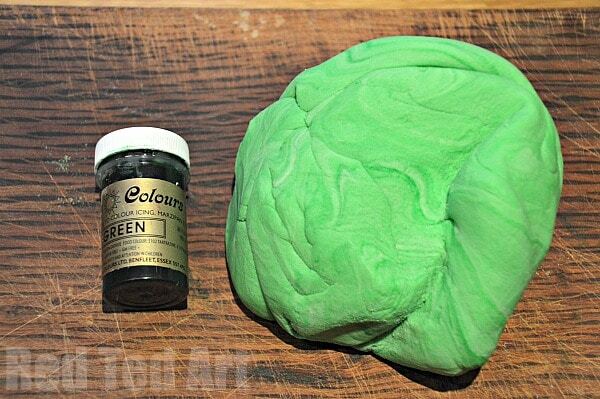 2) Colour your fondant icing and roll out. 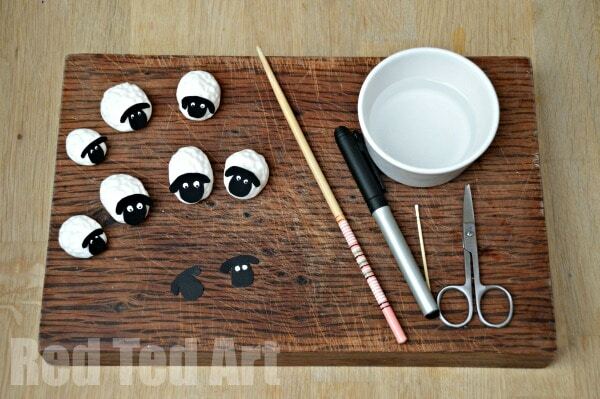 3) Cover your cakes in jam. 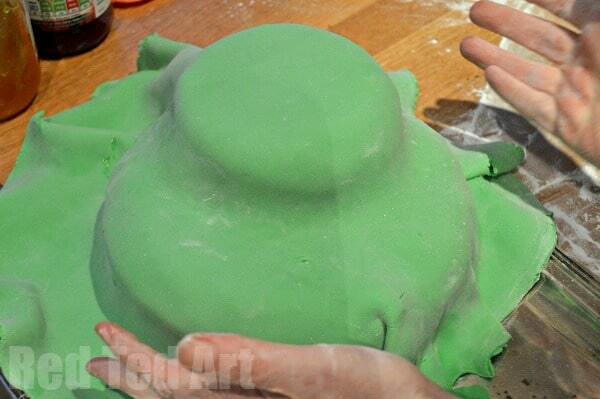 4) Carefully lift your icing OVER the your cake and tuck into place. Take your time over this, you want a nice neat finish. 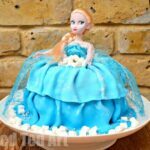 Trim away any fondant icing excess around the bottom of the cake. 5) Melt some chocolate in a bowl over hot water (you can do it in the microwave too, but I always end up burning the chocolate!!). Carefully cut your waffles to size – we cut most in half, but also had some in thirds. 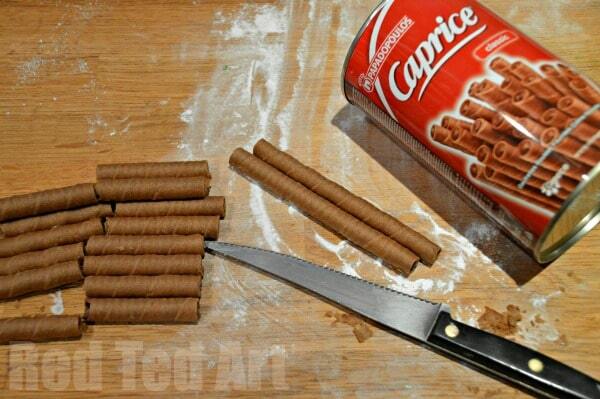 And stick these on using the melted chocolate and a knife to spread. 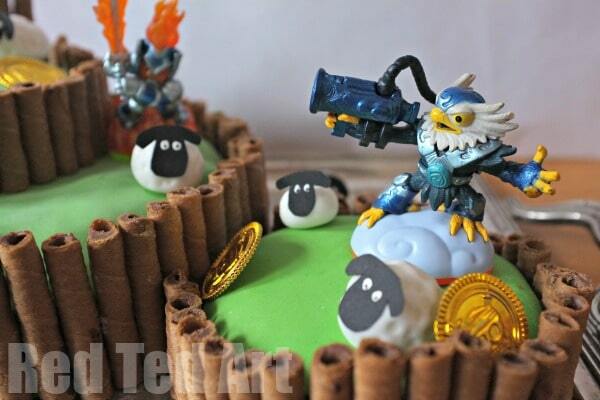 7) Arrange your sheep/ coins and Skylander figures around you cake! And done!!! 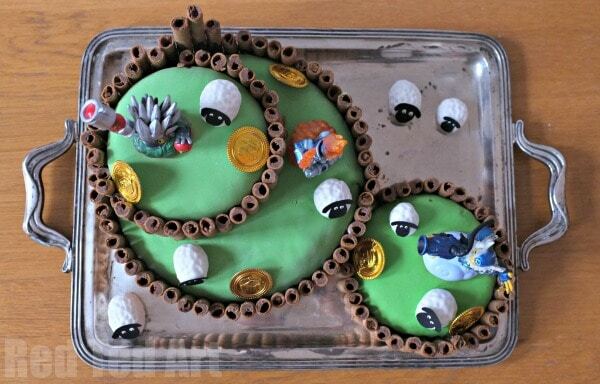 And top view of the Skylanders Cake! 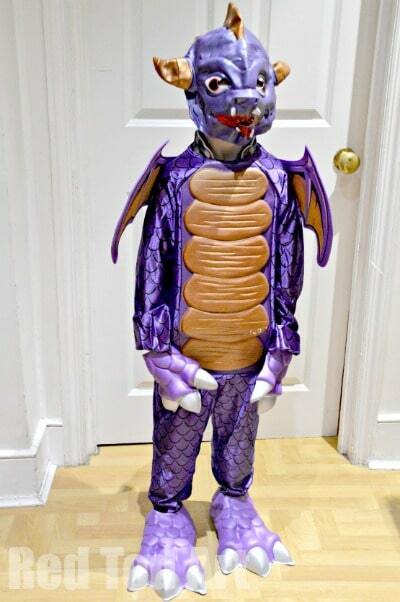 Red Ted was super happy to get a Spyro Costume too (thank you party delights). He wore it all day! We added Skylander Stickers to the party bags and had Skylander Badges as prizes for the games. Finally the kids all got a Skylander Figure off ebay (they didn’t mind at all that they were not “new”) and everyone was (Trigger) Happy! Check out these 112 (!!!) 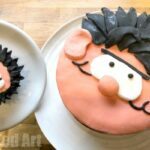 birthday cakes for boys for more ideas! 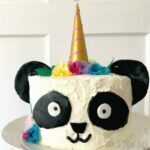 I think my son will want a Minecraft Party next year! 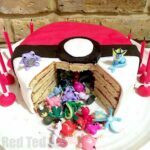 I LOVE this cake and so does my Skylanders obsessed son! 🙂 Can you please tell me how many inches were the two tins that you used?